build valuable assets for your overall marketing efforts. Guaranteed to make that phone ring! We can use your existing data to generate assets fast and effectively. Allowing for faster updates on your Catalog Marketing Campaigns. Let us show you how to maximize your efforts. Saddle Stitch Catalogs have a thick cover stock for enhanced quality and durability. A 100lb stitched cover is bound together with 100lb book or 70lb premium uncoated stock on the inside. Professional saddle stitching provides a secure binding for your documents. Available sizes include 8.5”x5.5” and 8.5“x11”. Up to 40 pages on Saddle Stitch. 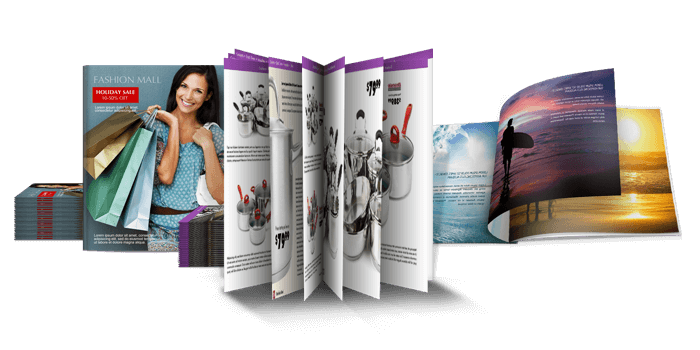 Perfect Bound Catalogs are made with Perfect Binding to give your catalogs a polished and refined look. They’re ideal for showcasing retail products, artwork and more. An uncoated 10pt C1S cover is bound together with uncoated 80lb book on the inside. Available sizes include 8.5”x5.5” and 8.5“x11”. Up to 92 pages on Perfect Bound.